Every profession has its share of misconceptions and myths, and CNC machining is no exception. Below are some of the most common misconceptions about CNC machining. This one is only half-true. CNC machining can prove to be easy. The whole concept behind it is that it makes machining parts faster, more consistently accurate and easier. However, it’s also substantially complicated. You continuously learn about it. Setting up your workspace, programming and making adjustments can almost always have room for improvement, even if it’s just a few seconds you save. Its benefits are improved product quality and faster production. Again, this is another half-truth. While not every person you meet is capable of becoming a CNC machinist, there is minimal training required to get started in some cases. However, there are many types of production that do require more than just basic skills. It takes skill to activate and monitor cycles, evaluating, loading and measuring workpieces and recognizing and replacing dull tools. Practiced operators make a huge difference in any CNC machine shop. A common myth is that CNC machining is totally automated. It seems like some people think that they can just push a button and simply watch the machine perform its function. It is important to understand that CNC is truly consistent in easier product quality and speed. However, it’s not perfect and it needs careful thought. The process still needs the workpiece setup and process to be analyzed before doing the job to ensure the part is produced in almost exactly the same way. Almost every CNC machine uses a CAM system, but it outputs the G-Code in order to run. CNC machinists find it easier to modify G-Code than altering the CAM system. 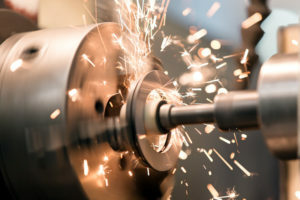 When you understand these four misconceptions about CNC machining, you will see how valuable it is to have someone skilled in CNC. Contact N&S Flame Spray today!